Posted on Tue, Dec 20, 2011 : 5:58 a.m.
HealPay, an Ann Arbor-based technology startup, has secured an early-stage venture investment to expand development and sales of its software for the debt collection industry and large companies with delinquent accounts. HealPay co-founder Erick Bzovi said the angel investment was a "few hundred thousand dollars" and came from private individuals with 10 to 20 years of debt collection experience. The investors got a minority equity stake in the company in exchange for their investment. 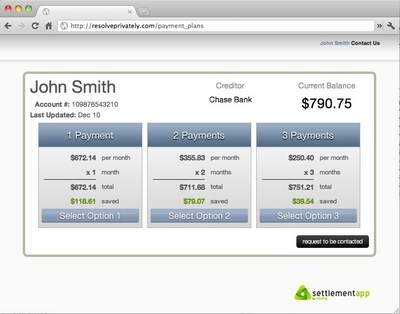 HealPay's software allows people to pay off debts through collection agencies online. HealPay recently secured an early-stage investment. “It took us six months on the fundraising trail to secure it,” Bzovi said. “We met with angel groups in Ann Arbor and Detroit and it went back to finding people who are in the space who understand, who are business professionals in collections and those are our best strategic partners. Bzovi said the idea to create the company came about after he met his co-founder Lancelot, who was doing consulting work for a collection agency. “The reason it was appealing, although it’s kind of an unsexy thing, is because it’s a common sense thing," he said. "So many people are in debt. We realized there was an opportunity here. People need to pay their bills but they just don’t have the software or technology to do it. None of us want to deal with people when paying bills. Bzovi said since HealPay’s May 2010 launch, a handful of agencies have signed up to use the software. Today, HealPay says it has more than 500,000 debtors signed up through its system. “We’ve collected over $500,000 in debt or receivables,” he said. Agencies "use our software to send out links and payment plans and in turn their debtors are logging on making payments. We measure success by the number of debtors we have paying. The process to sign up is relatively easy, Bzovi said. The allure of his company, Bzovi said, is due largely in part to how historical data is used to set payment plans. Studies have shown that consumers like having options set forth before them and this is what HealPay offers, Bzovi said. “The whole idea behind this is behavioral economics,” he said. “When you present people with three options, they’re likely to compare it amongst each other. If you create that environment and they’re able to decide which option is attractive then it’s better than the status quo which is giving them one option. As the company continues to expand, Bzovi said he’ll be looking to hire one or two new employees at its office located at Liberty and Main Street. Fri, Dec 30, 2011 : 8:53 p.m.
Tue, Dec 20, 2011 : 12:53 p.m. The estimated population of the United States is 311,886,750...so each citizen's share of this debt is $48,459.31. Welp. Tue, Dec 20, 2011 : 4:47 p.m.
Jeff W...hopefully we can make it easier to resolve debt that plagues so many people and students.